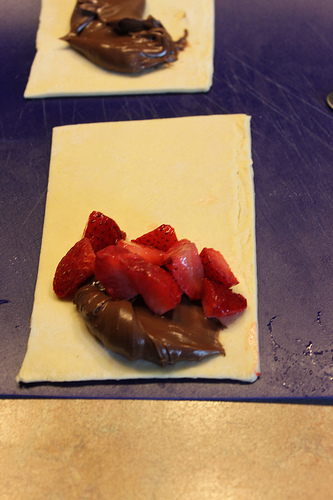 Roll out your pastry sheet with a rolling pin. This is where the flour comes in as you may need the flour so it doesn’t stick to the rolling pin, of course. I cut the pastry sheet into 6 rectangle. You could also cut into 4 rectangles if you want them to be bigger. Scoop a bit of Nutella (about a spoonful) and a about a spoonful of the berries of your choice onto the pastry. Then fold over to close. Seal by pressing the edges of the pastry dough tight. Use a fork to make a decorative edge. 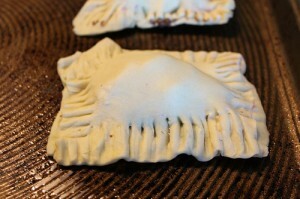 Then cut a slit or two in the top of the pastry. At this point you can either brush with beaten egg or spray cooking spray on the pastries. I tried it both ways and they tasted fine either way. Sprinkle with a bit of sugar. Cook at 400 degrees for around 15 minutes or until golden brown. The family LOVED this recipe! I tried it last night with frozen berries as we were out of fresh. 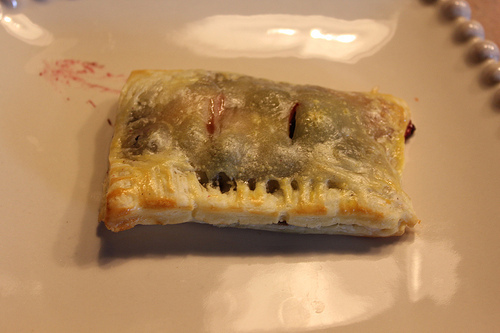 They were a little juicier so next time I might thaw the berries and rinse before just placing them in the pastry. Based on this recipe from Dam* Delicious. Yum! It’s like a French crepe, but homemade in the kitchen. Can’t go wrong with Nutella, even if it isn’t the healthiest treat around.